Honestly, I've found that I'm somewhat addicted to beans (which probably explains why CH and I affectionately call each other "Beans" on occasion...awww). Anyway, I love their versatility: they can be eaten hot or cold; can be used dried or from a can; and are perfect as part of a side dish or even as the "main event." Although black beans are my all-time favorite, a variety of other kinds are quickly moving up on my list. Typically, I prefer chickpeas in the form of falafel or hummus. I also like them in soups/stews, because they usually taste kind of funny to me when I eat them cold, as whole beans. 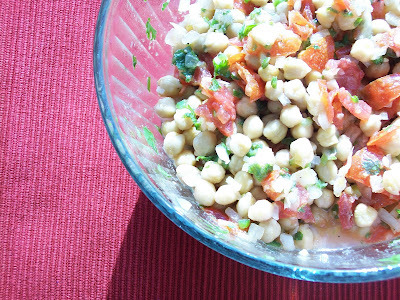 Actually, if I eat enough chickpeas, their taste starts to remind me of tuna fish, which makes me a bit unsettled. Interestingly though, after doing a bit of recipe googling, I discovered that chickpeas are often used as a vegetarian substitute for tuna salad. Hmmm...maybe my taste buds are even more well-developed than I previously thought. 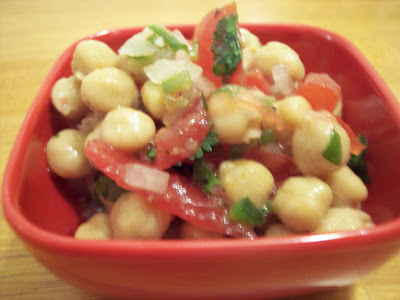 So, I found this Mexican-Chickpea Salad on the Food Network website. I actually didn't like it that much, but maybe that's because I left out the chipotle peppers. (While I do love jalapeños, I cannot stand chipotles, which are smoked jalapeños.) Despite that fact, I decided to go ahead and post the pictures and a link to the recipe anyway. Who knows, maybe some of you will find this recipe more to your liking. In the mean time, at least it looks nice! You can find the recipe here. Add all ingredients to a large bowl & refrigerate for at least 2 hours. Season with salt & additional lime juice, as desired. Serve salad cool or at room temperature. These are the kinds of dishes I love, and could eat by the bowl-ful! this recipe is no longer posted at the food network site. if you have the recipe would you please now post it on your site?